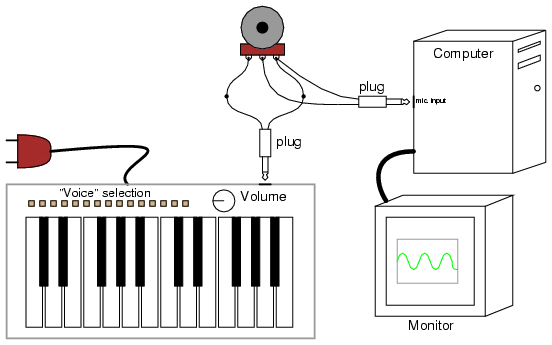 Parts and equipment for this experiment are identical to those required for the "PC oscilloscope" experiment. The Winscope program comes with another feature other than the typical "time-domain" oscilloscope display: "frequency-domain" display, which plots amplitude (vertical) over frequency (horizontal). An oscilloscope's "time-domain" display plots amplitude (vertical) over time (horizontal), which is fine for displaying waveshape. However, when it is desirable to see the harmonic constituency of a complex wave, a frequency-domain plot is the best tool. If using Winscope, click on the "rainbow" icon to switch to frequency-domain mode. Generate a sine-wave signal using the musical keyboard (panflute or flute voice), and you should see a single "spike" on the display, corresponding to the amplitude of the single-frequency signal. Moving the mouse cursor beneath the peak should result in the frequency being displayed numerically at the bottom of the screen. If two notes are activated on the musical keyboard, the plot should show two distinct peaks, each one corresponding to a particular note (frequency). Basic chords (three notes) produce three spikes on the frequency-domain plot, and so on. Contrast this with normal oscilloscope (time-domain) plot by clicking once again on the "rainbow" icon. A musical chord displayed in time-domain format is a very complex waveform, but is quite simple to resolve into constituent notes (frequencies) on a frequency-domain display. Experiment with different instrument "voices" on the musical keyboard, correlating the time-domain plot with the frequency-domain plot. Waveforms that are symmetrical above and below their centerlines contain only odd-numbered harmonics (odd-integer multiples of the base, or fundamental frequency), while nonsymmetrical waveforms contain even-numbered harmonics as well. Use the cursor to locate the specific frequency of each peak on the plot, and a calculator to determine whether each peak is even- or odd-numbered.